These small mountain-inspired ornaments can be used to make pins, brooches, and necklaces. The set includes instructions for a mountain, a pine tree, and a big horned sheep. My favourite way to use these is to attach a safety pin onto the back of each one and decorate my project bags with them. I published my very first pattern in January 2014, named Chevron Cowl. I originally knit the cowl in bright colours and lately I find myself wearing neutrals and less saturated colours so I wanted to re-knit the cowl in yarn that I would wear more. I chose Knitpick’s Chroma worsted weight yarn in the colour Sandpiper for one of my chevron colours and then I went with white and black yarn for the other two colours to keep it neutral. I’ve also decided to rename the pattern. After reading a very good article on the Love Knitting blog by Kate Atherly (linked below) about naming patterns I decided that I want to switch to more unique pattern names. Laila Peak is a beautiful mountain in Pakistan that the peaks of the chevron design remind me of. This sweet cozy is knit using the beautiful ‘daisy’ stitch. 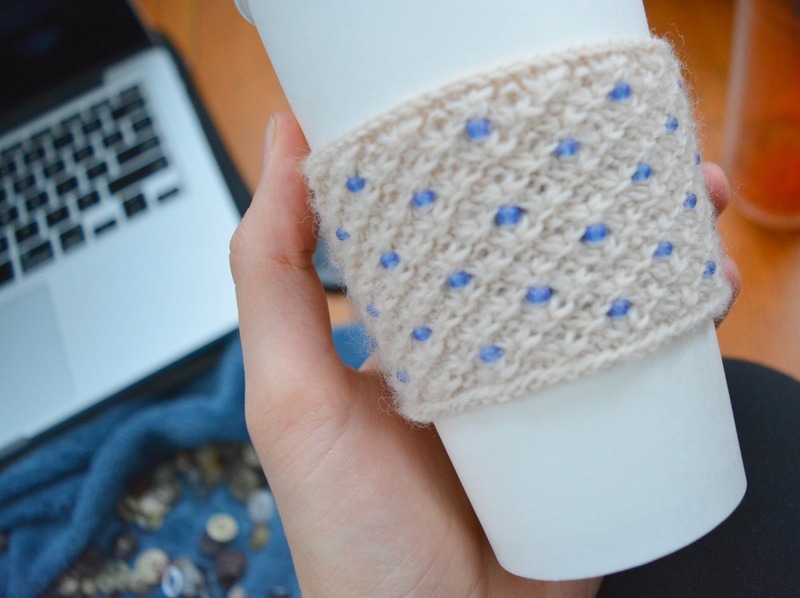 The cozy is made to fit most medium size coffee cups perfectly. You can reduce waste by using this reusable sleeve instead of double cupping or using a disposable paper sleeve. I have been a fruit fiend for as long as I can remember. I was always the sticky-fingered child at birthday parties, eating more then my fair share of the watermelon. I think this may be due to living in the arctic for part of my childhood, where good fruit was expensive and only a treat. I remember one day during a summer day camp up north when one of the boys got an orange in his lunch, the other kids and I were so envious that we followed him around during the lunch period begging for a piece of the peel. The peel! Not that we didn’t have plenty of food to go around when I was young, but fruit was definitely special in a place where it doesn’t grow. And to this day I can’t get enough. I lug heavy bags of melons, peaches, and berries back from the farmer’s market to my apartment. I can’t get over the abundance of it! Fruit is so bright and happy and it has inspired my latest pattern, the Pineapple Socks. This pattern is available now on Ravelry!